Configure your URL for the content type/node type you want the different section with a theme for. 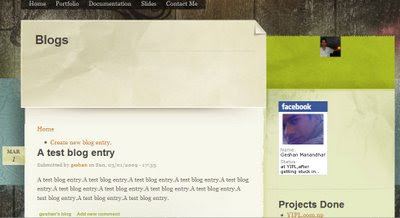 In this example I am having a different theme for blogs. Make Sure your section is enabled as below. Enjoy the different them but after some configuration defined in things to consider below. You must have two or more themes active at Administer>>Site Building>>Themes and have the respective blocks placed on respective theme regions for the block to appear as you want on the themes when activated. Block can be placed aptly for themes at Adminster>>Site Building>>Blocks. 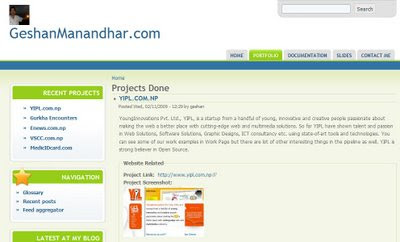 Live Demo of this tutorial can be witnessed at http://www.geshanmanandhar.com , the main site has Acquia Marina theme. 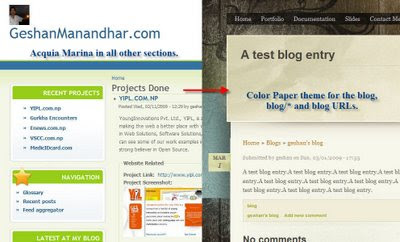 The blog section at http://www.geshanmanandhar.com/blog has Color Paper Theme. The blog section is just for testing now :-). 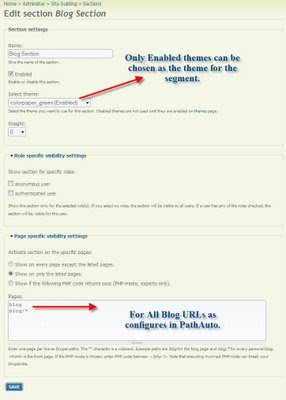 This is a very useful feature in Drupal you can even have multiple themes as per pages if you create sections for each page but it will be best utilized when used for sections like blogs, forums, news etc. 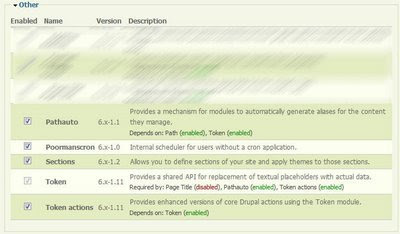 Multiple themes in same Drupal site if fun, useful and applicable.